I just read this 1947 book by Lewis as a part of a study on present day Charismatics. Among more recent books on the miraculous, this was a pleasant discovery and a refreshing engagement. Though you have to read Lewis in low gear, the slow journey is always worth it. Chapter fourteen, ‘‘The Grand Miracle’’ on the resurrection is the best I have read on the probability of Christ’s resurrection. 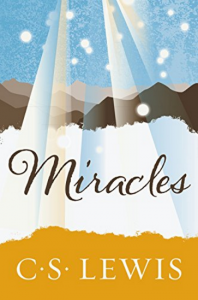 Lewis presents the Incarnation as the root from which all other miracles grow. Appendix B is also the best chapter I have found on the correlation among prayer, free will and the intervention of God. ‘‘Most of our prayers,’’ says Lewis, ‘‘if fully analyzed, ask either for a miracle or for events whose foundation will have to have been laid before I was born, indeed laid when the universe began.’’ And yet he believes prayer changes things! Lewis’ uniqueness can be felt in statements like, “Almost the whole of Christian theology could perhaps be deduced from the two facts (a) that men make coarse jokes, and (b) that they feel the dead to be uncanny.” What he is saying is that man knows he is a less than perfect being and that there is something waiting for him after death! Go back and read an old book!